Pigmentation or body color patterns in insects quite often differ not only between species but also in different stages of development and in different body regions of a single species. Body coloration plays physiologically and ecologically important roles as for instance in species recognition and communication, courtship/mate selection, mimicry, crypsis, warning, prey-predator/parasite interactions, and resistance to temperature, desiccation and absorbs or reflects harmful ultraviolet radiation. Many kinds of pigment molecules and structural colors contribute to the diversity of body coloration in insects. Recent studies have elucidated some of the genetic and molecular biological mechanisms underlying pigment biosynthesis. This chapter focuses on the pigments derived from the amino acid tyrosine. The tyrosine-mediated cuticle tanning pathway is responsible for production of melanins and other pigments derived from 3,4-dihydroxyphenylalanine (DOPA) and dopamine as well as from N-acyldopamines. The N-acylated dopamines, in addition, are oxidized by the phenoloxidase laccase 2 to form quinones and quinone methides, which then undergo cross-linking reactions with cuticular proteins (CPs) for cuticle sclerotization. We review the regulation and functional importance and also the diversity of the genes involved in this pathway. 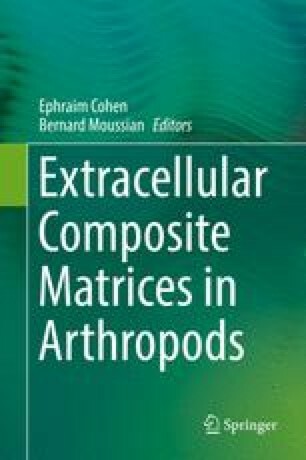 The unique localization and cross-linking of specific CPs for morphology and ultrastructure of the exoskeleton are also discussed. This work was supported by the Basic Science Research Program through the National Research Foundation of Korea (NRF) funded by the Ministry of Science, ICT and future Planning (NRF-2015R1A2A2A01006614), Bio-industry Technology Development Program (111107011SB010), Ministry for Food, Agriculture, Forestry and Fisheries, and Basic Science Research Program through the NRF funded by the Ministry of Education (NRF-2015R1A6A3A04060323) to MYN.